When every national news outlet reported the story of the 18th century diet of the St Kildans just before Christmas, I was ready to cry fowl (sorry). 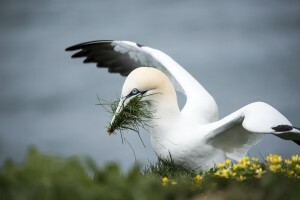 A newly-discovered census from 1764, it was said, declared that the 90 residents of the remote islands each ate 18 seabirds and 36 seabirds eggs a day. The gannet: could you eighteen a day? Firstly, I thought, that’s far too many birds and eggs for anyone to eat in a day, even on the most generous of interpretations. If each bird yielded just 4oz of meat, that’s 4.5lb, and if each egg weighs about half as much as a large hen’s egg, that’s 2.5lb of eggs. 7lb of food, all protein and fat. I suspect the actual total would be nearer 10lb or more; and it could be a lot more, half a pound of meat per bird and eggs the size of a hen’s make 14lbs. Perhaps someone who has eaten guga can give me an idea of how much meat there is on a gannet, one of the birds the St Kildans ate? So, I thought, either this is evidence of a paleo diet being taken to extremes – they were living in conditions not far from stone age, to be fair – or there’s something wrong with the interpretation. So I got hold of the original press release from the National Register of Archives for Scotland, looked at the transcript, checked on the photo facsimile, and there the census taker does indeed record that each of the 90 inhabitants ate the amounts reported. How could I have doubted my colleagues in the press? Well, it was the way the figure was reported, without even an expression of surprise, a question to a dietician, or a reference to some other expert. Get the press release, waft it in, no questions. And more doubts: the St Kildans had some potatoes, oats, eggs and fish. How could they manage to cram that in on top of more than 7lb of protein? Why would they risk life and limb for more protein than they really needed, even if they really liked the taste of birds and eggs? You might say it doesn’t matter, it’s a good tale, no-one died and where it’s unimportant it’s true that sometimes we don’t let the facts spoil a good yarn. But there might be an even better tale within. Picture this. A census taker from some landlord or government agency of the 18th century pitches up in St Kilda in 1764. He’s a gent with pretensions, he’s probably not too pleased about being sent out here, and has been puking all the 40 miles from Lewis. They, in turn, think he’s a right knob. So at some point he asks the head honcho of the St Kildan’s, let’s call him Old Angus, just how many birds and eggs everyone on the island eats per day. There’s not a lot of entertainment on St Kilda even today, and back then there was even less, so they had to take their fun where they could. Angus sees his chance. The idea that he or anyone else keeps a record of what they scoff, has worked out averages, and can trot the statistics out, is beyond ridiculous. But putting on his most serious face, he thinks of a number some way beyond the realms of realistic, a factoid that can be disproved with a bit of arithmetic but which has the ring of truth (think “60% of Americans now weigh more than half a tonne…”). Everyone keeps a straight face as the census-taker swallows it, writes it carefully on the census document, and is rowed out to the waiting brig to take him back to civilisation. At which point the merriment begins, howls of laughter from the St Kildans at the idea that he bought this preposterous figure. They can’t look each other in the eye. Every time someone mentions birds (which they do a lot, because they DO eat a lot of them) the laughter starts again. Or the figure 18, or 36. Angus’s mate Hector sees him coming down the street, sticks out his belly and puffs out his cheeks, putting on a porky waddle. The laughter starts again.